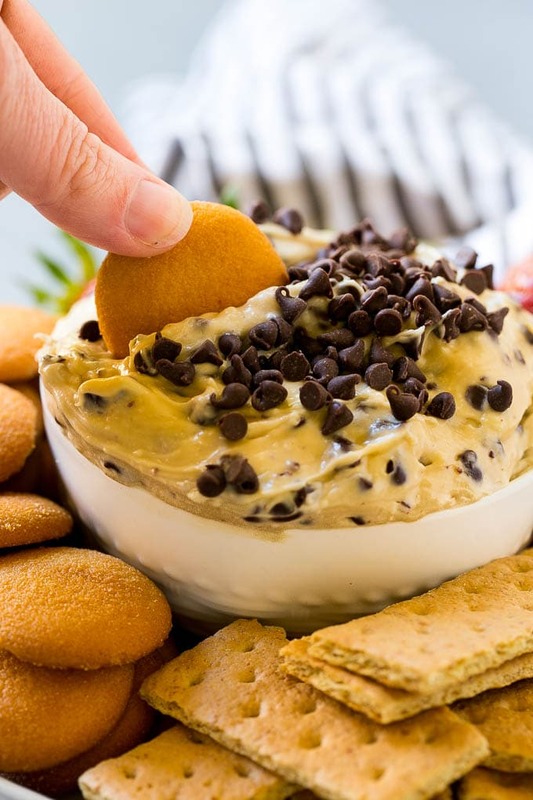 This cookie dough dip tastes like chocolate chip cookies, but is egg free and flour free making it totally safe to eat! 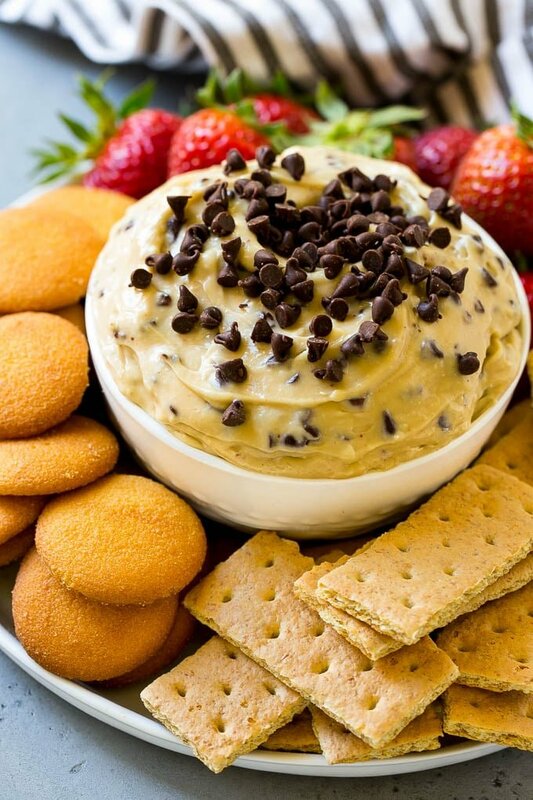 Serve your cookie dough dip with graham crackers, vanilla wafers and fruit for a fun and unexpected snack or dessert. I’m one of those people who can’t resist taking a taste of cookie dough before it goes into the oven. 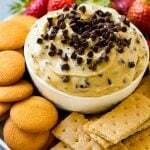 This creamy cookie dough dip has the flavor of chocolate chip cookies and only takes 5 minutes to make. 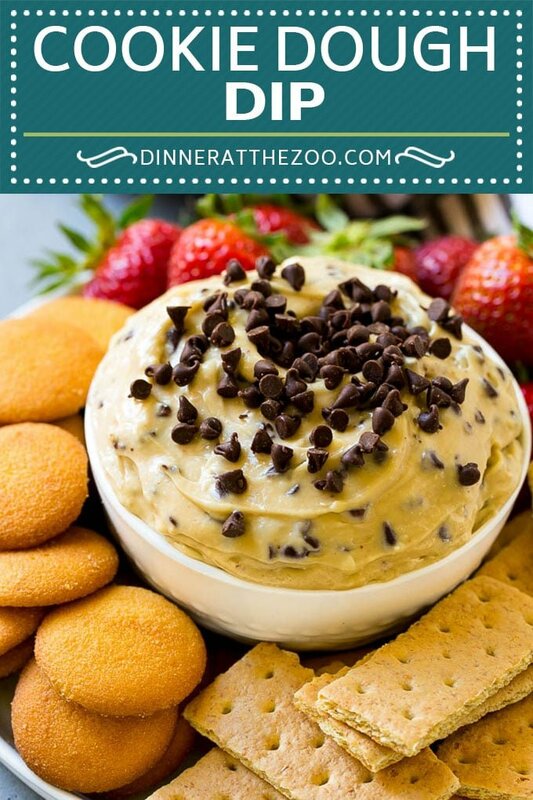 When I want a quick dessert that I know will be a hit, I always think of cookie dough dip. We’ve all been warned about eating cookie dough. However, the great thing about this sweet, decadent dip is the fact that there’s no eggs or flour, so it’s completely safe to gobble up! HOW DO YOU MAKE COOKIE DOUGH DIP? 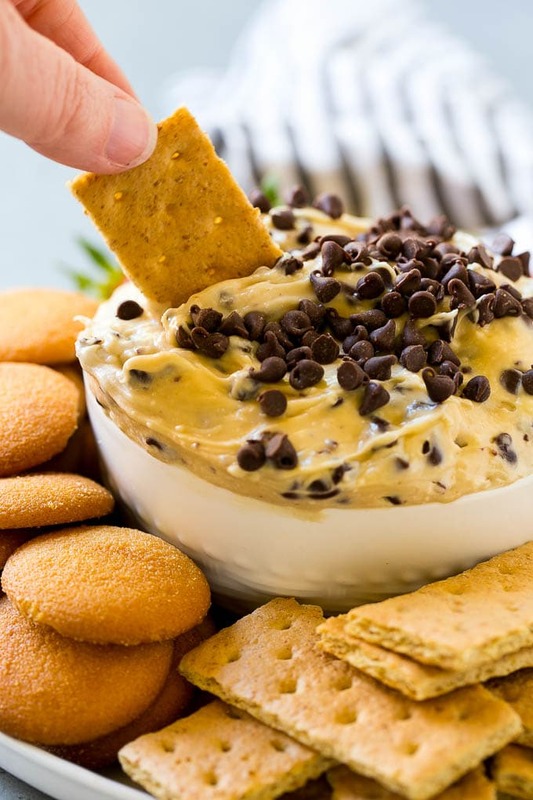 If you’ve got five minutes, a bowl, and a spoon, you’re all set to tackle this delicious cookie dough dip. Simply add your softened butter and cream cheese to a bowl and beat until smooth. Add the milk to the bowl and mix until smooth again. To finish, add in all your ingredients except the chocolate chips, which get folded in at the end and sprinkled over the top. The best thing about this dip is how quick it is to make. I mentioned earlier that it only takes 5 minutes. However, if you decide to make it in advance, be sure to refrigerate it. If you’re serving the dip after it’s been chilled, give it a little time at room temperature so that it’s soft and spreadable. I use semi sweet chocolate chips because they’re classic in chocolate chip cookie dough. Feel free to use any kind of chocolate that you like; white chocolate chips, milk chocolate chips and butterscotch chips all work great. 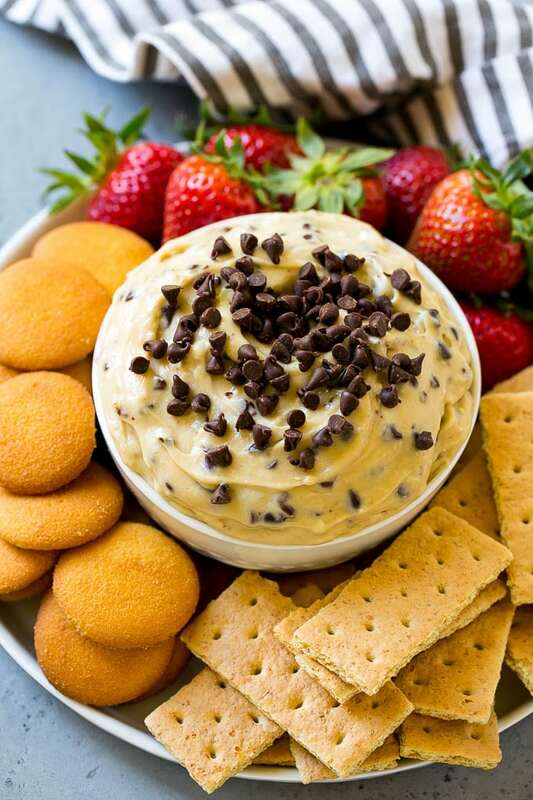 Think of it like a cookie, whatever your favorite toppings or additions are for cookies, use those in this cookie dough dip! The raw eggs usually included in normal cookie dough are the focus of concern, as you can chance getting salmonella. However, it’s not common for people to get sick eating raw eggs, it’s just a risk that’s good to be aware of. Uncooked flour can also sometimes make you sick. This cookie dough dip is egg and flour free so no chance of salmonella here! Eggs are truly only necessary if you’re going to bake the batter. They help bind ingredients together as well as assist in making the cookies a little fluffier. However, if you don’t plan on baking your batter, you can prepare recipes like this dip or your normal cookie recipe and just exclude the eggs without compromising on the taste. I can’t tell you how many times I’ve prepared this dip. The entire family loves it and the recipe has been passed on to friends and relatives who fell in love with it as well. There’s no rule that says great dessert recipes have to be complicated! Place the butter and cream cheese in the bowl of a mixer. Beat until smooth and creamy. Add the milk and beat until smooth. Add the brown sugar, powdered sugar and vanilla extract, then beat until smooth. Spoon into a bowl. Top with additional chocolate chips and serve. Another wining recipe at office potluck. Everyone couldn’t get enough of it. What a great dip! This would be fun for serving at game night or a slumber party! I know my kids would love it! OMG! This would really be a crowd pleaser! I’m making it this weekend for my movie group! Cookie dough looks delicious, my kids will love it, I you are a genius I am going to try it. Yummy! 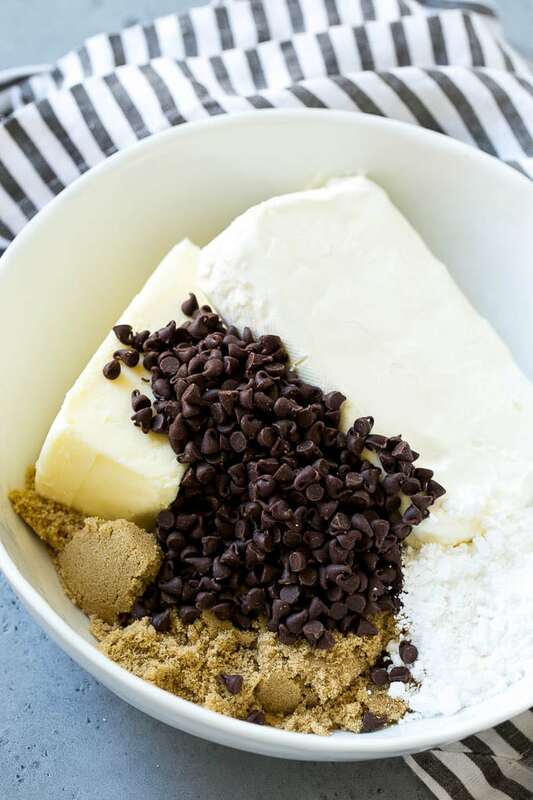 I am a huge cookie dough fan – so this would be the perfect snack (though I will have to substitute the sugar because I am sugar-free) for late at night. I love cookie dough! I think I have a new favorite here. It’s so easy to make. Yum! And these are egg free, so yummy! I’ll take some with my coffee right now please. Yummy..Egg free and flour free is awesome, with less calories as who wants to gain weight, yucky!!!! !